Indian Oil Corporation Limited, the largest commercial undertaking in India and a fortune “Global 500” company, invites applications from Indian Nationals meeting the following educational qualification and other parameters for the under mentioned posts in the pay scale of Rs 11900- Rs 32000, at Indian Oil Corporation Limited, Guwahati Refinery. Age limit: Minimum 18 years and maximum 26 years as on 01.11.2015 for general candidates. (Relaxable by 5 years for SCI ST and 3 years for OBC against reserved positions). Experience: Minimum one year of post qualification experience in operation (rotating shift) of Pump House, Fired Heater, Compressor, Distillation Column, Reactor, Heat exchanger etc. in a Petroleum Refinery, Petrochemicals / Fertilizer/ Heavy Chemical / Gas Processing Industry. 2. Junior Engineering Assistant-IV (Mechanical): 3 years Diploma in Mechanical Engg. or Matric with ITI in Fitter Trade. Power Plants / large industrial establishments. 2. B Sc (PCM) with an Apprenticeship Training in Boiler Trade. a) It will be the responsibility of the selected candidate to acquire Boiler Competency certificate within two years of joining the services of the Corporation. b) The selected candidate / employee will not be considered for promotion to the next higher grade/scale of pay till he acquires the Boiler Competency certificate. * For candidates possessing Diploma or Matric with ITI (Fitter) & holding Boiler Competency Certificate, no experience shall be required. *For candidates possessing Diploma, minimum one year post qualification experience in operation/maintenance of industrial Boiler/HRSG/Thermal Power Station/DM plant/RO Plant/Air Compressors/Steam Turbines/Gas turbines Cooling tower/air compressor in Petroleum Refinery/Petrochemicals/Heavy Chemical/ Fertilizers/Power Plants/large industrial establishments. 4. Junior Engineering Assistant-IV (Electrical): 3 years Diploma in Electrical Engineering. 5. Junior Engineering Assistant-IV (Instrumentation): 3 years Diploma in Instrumentation / Instrumentation & Electronics Instrumentation & Control Engineering. Experience: Minimum one year of post qualification experience in maintenance of modern instrumentation control system like DCS PLC with electronic field instrumentation, Control valve, Smart positioners, Ioop configuration, online analyzers condition monitoring, cabling, earthing etc. m a Petroleum Refinery / Petrochemical / Heavy Chemical/Fertilizers / Power Plants/Oil & Natural Gas exploration/large industrial establishments. Application Fee: OBC & General candidates are required to attach a crossed Demand Draft of Rs. 100/- (Rs. One Hundred only) as application fee (non-refundable) in favour of Indian Oil Corporation Limited (Refineries Division) payable at State Bank of India, Guwahati Refinery Complex Branch (Branch code:6196, IFSC Code:SBIN0006196) along with application. Candidates must write their full name and address on the back side of the Demand Draft SC/ST/EXSM/PWD candidates are exempted from payment of application fee. How to apply: Applications in the prescribed format (neatly typed), supported by all relevant self authenticated documents (qualification/experience/age/caste etc.) with latest passport size photograph affixed should be sent by Ordinary Post to Guwahati GPO. Post Box No-163, Meghdoot Bhawan, Panbazar, Guwahati-781001. 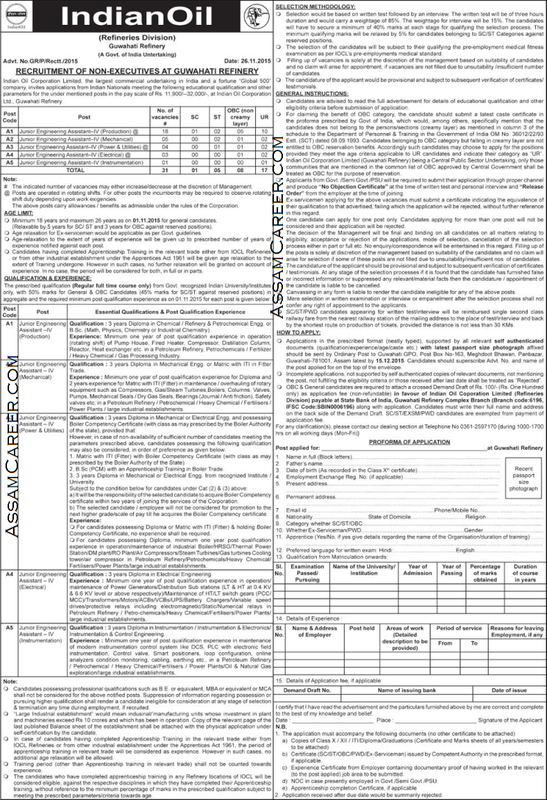 Assam latest by 15.12.2015 Candidates should superscribe Advt. No. and name of the post applied for on the top of the envelope.